The good news is this book, unlike the notorious Nobody Died at Sandy Hook (2015), was not ‘banned' by Amazon. The bad news is that with the Boston stage performance, many in the alternative community—which initially was all over the false-flag indicators and images in real time that completely demolished the official story—seemed to stop writing and caring a month later. Was it because the two alleged terrorists had hard-to-spell names and a Muslim orientation? Did the government’s case miraculously start making sense? Or did higher priority stories come along, e.g. what ‘the Donald’ ate for breakfast yesterday morning? Re-published from Fellowship of the Minds. 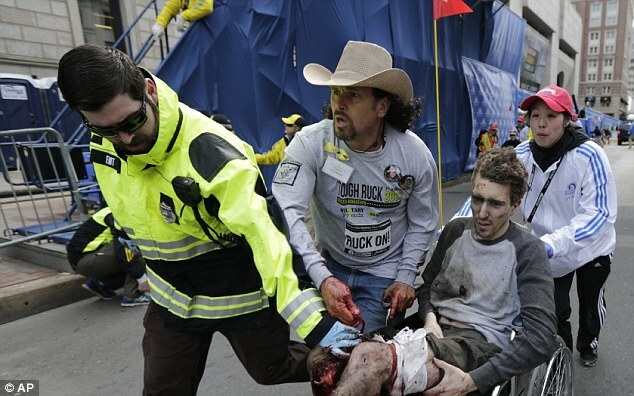 Alleged victim of the 2013 Boston Marathon bombings, Jeff Bauman, is an example of an amputee crisis actor. See the reasons why in “Hollywood producer Nathan Folks says Boston Bombing’s a false flag”. Now add fake political protests and protesters to the things that crisis actors do. A widely overlooked element of the Boston Marathon bombing event involves photographs of the backpacks carrying the explosives that purportedly killed 3 bystanders and maimed and injured dozens more. The white tabs on the black backpacks are passive RFID adhesive tracking tags/labels. Such devices are used to track merchandise from manufacture to consumer and for check-in/check-out operations. The two largest entities in the USA that require these identifying tags/labels are Walmart and the Department of Defense. With the ‘Anti-firearms’ moves that started in the 1980’s a young American woman moved to Australia. Rebecca Peters studied law for two years and then quit. She became employed by ‘The Australian Broadcasting Commission’ (ABC), and then started ‘The National Coalition for Gun Control’. At the time she also coyly joked about the rumours that her father was ‘CIA’.